In a surprising move, the toll levy contractor SMYR consortium today appeared before Supreme Court and expressed inability to make the collection of environment compensation charge imposed by the apex court on polluting commercial vehicles entering Delhi citing several problems including financial loss. Making its points clear through senior lawyer Shyam Divan who represented them, SMYR requested the court to recall its October 9 order for levy of Rs 700 and Rs 1,300 from commercial vehicles or allow it to opt out of the tax collection job. The company said such a direction should not have been passed without giving it a hearing as it had several repercussions and a huge duty had been cast on it which could even lead to massive financial losses to it. The submissions came after the bench headed by Chief Justice H L Dattu took serious note of SMYR’s refusal to collect environment compensation charge from November 1 to 6 and threatened contempt of court action if it continued to do so. “From newspaper reports we came to know that from November 1 to November 6 no tax was collected. Why ? We are seeing highest pollution in Delhi. People dread to go out. If contractors disobey our order we will initiate contempt proceedings against them. We are taking these steps to save Delhi and the people of Delhi”, said CJI Dattu. Senior advocate Shyam Divan who appeared for SMYR alleged that the levy was beyond the terms of agreement entered into between it and the civic body. “The minimum requirement in the interest of natural justice was that we should have been heard before the tax was imposed. It is not possible for me to commercially continue toll collection. Pollution may be reduced but not at my cost. A huge burden and obligation has been imposed on me without hearing me”, he said. “If these clause were there earlier, I would not have perhaps bid for the tender and accepted the contract Let them some others come in for the job. I wont mind ..Leave me out of it. I don’t want to take up the responsibility. I better I opt out”, said Divan. SMYR claimed they had no power to collect the tax and that their employees refused to do so, fearing violence from angry truckers. In a significant effort to bring down Delhi's deadly air pollution level, the Supreme Court had on October 9 ordered the authorities concerned to levy an environment compensation charge of Rs 1,300 on heavy commercial vehicles and Rs 700 on light trucks, which enter the Capital from neighbouring states and travel through it spewing noxious fumes. The SC had directed the Delhi government and MCD to levy the charges from November 1. "Commercial vehicles entering Delhi spew close to 30% of the total particulate load and 22% of the total nitrogen oxide load from the transport sector. 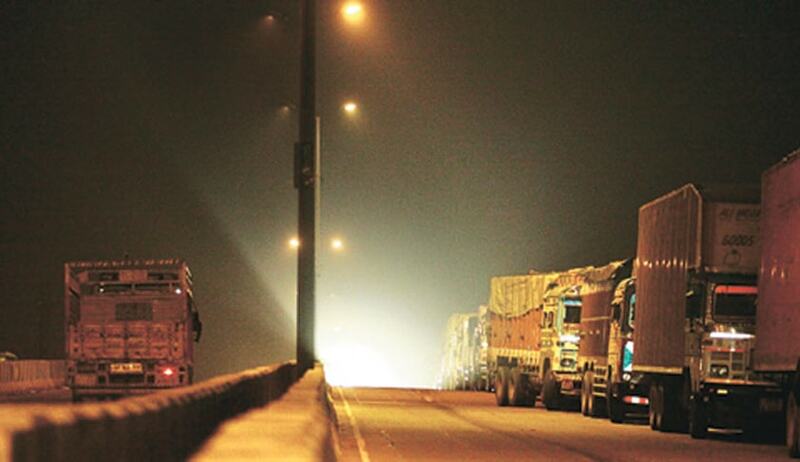 Around 23% of the commercial vehicles and 40-60 per cent of the heavy trucks entering Delhi use it as a transit route," the bench headed by CJI HL Dattu.